1. Start with the brigadeiro. In a medium, heavy-based saucepan, heat the butter, condensed milk, cocoa and a pinch of salt until boiling, stirring constantly with a wooden spoon. Reduce the heat to medium-low and cook for 10-15 minutes, stirring constantly, until the mixture is thick and shiny and starts to pull away from the bottom of the pan. Stir in the vanilla and vigorously mix again. Pour the mixture onto a baking parchment-lined plate and chill, uncovered, for at least 2 hours. 2. Preheat the oven to 180˚C (or set up your barbecue to a high heat with the lid on). In a small bowl, mix together the fl our, baking powder and salt. In a large bowl, beat together the butter, brown sugar and caster sugar, until light and fl uffy. Beat in the vanilla and egg until combined. Add the fl our mixture and beat until just combined. 3. 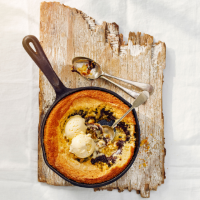 Take a 20cm ovenproof frying pan (or solid cake tin) and cover the base with ½ the cookie dough. Push down to create a smaller indented circle in the middle (about 16cm in diameter), then take the chilled brigadiero mix and roll between sheets of baking parchment to a circle that fi ts into the indented dough and sit it inside. Spread the remaining cookie dough over the top. 4. Either bake in the oven or cook on the hot barbecue with the lid on for 20-25 minutes or until golden on top, but still soft in the middle. Take the pan out and leave for 5 minutes; the cookie should be just starting to set at the edges. If it’s still too loose, heat on the hob for a little longer. Serve hot in the pan to share, with scoops of vanilla ice cream on top, if liked.